The Filming Location Of Which Of These 1990s TV Shows Was A Closely Guarded Secret? What Was The First Software Easter Egg? The filming locations of most popular TV shows, both during the filming process and afterwards, are well known. If you’re ever in San Francisco, you can swing by the house used for the exterior shots of Full House. Want to see the Mrs. Doubtfire house? You can visit that one in San Francisco too. Love the X-Files? You can tour Vancouver and see dozens of places the popular show was filmed at during the first five seasons. The locations of these places was never a particularly guarded secret and if you’ve ever looked at paparazzi shots of TV shows and films in progress, you’ll see star struck fans outside the view of the director’s camera. Curiously, however, one of the filming locations you’d least expect to be a closely guarded secret was, in fact, so closely guarded that visitors to the set were blindfolded before they were brought to see it. What kind of set merits this kind of secrecy? Believe it or not, the set of the Teletubbies, a show filmed between between 1997 and 2001 (and was briefly revived in 2015), was treated to this level of secrecy. If you’re at all familiar with the show, then you’ll recall that the main set of the show is a giant green hobbit-hole like house with large arched windows, rolling green hills, and a blue sky dotted with fluffy clouds. The whole thing is so picture perfect that it would be easy to assume it was filmed on a studio set with the clouds pasted into the background during post production. In reality, however, the green dome house actually existed as a real structure in the English countryside. 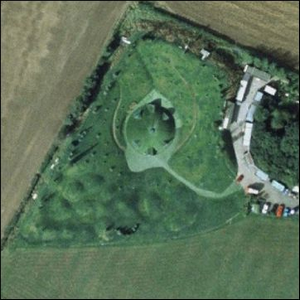 The reason the Teletubbies house was set down in a green glen of sorts was to hide it from the public eye. The location, additionally, was bordered by trees and the only people brought out to the location were members of the crew (who were sworn to secrecy) and special guests (who were blindfolded and driven around for a spell before their visit). Why all the secrecy? The set was expensive to build, needed to be maintained in immaculate condition so that it looked the same in every episode, and any damage to it by curious tourists or vandals would set back the filming schedule. Throughout the multi-year run the show enjoyed, the location was kept secret and today, should you happen upon the location out in the English countryside, all you’ll find is a lovely wildlife pond: after filming wrapped up, they removed the entire set and paid to have the land converted back to a natural habitat, letting nature reclaim the depression it was previously hidden in.